Hi, I am interested in your 1965 Ford F100 (stock #1330-NSH) listed on Autotrader for $33,995. I'd like to get more information about this vehicle and confirm its availability. 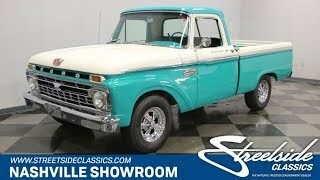 This is the finest example of a stock 65 F100 that you are going to find. The show quality restoration is first class with paint that shines even better than it did when it was new. This truck is best appreciated up close and personally, so come on down and check it out. Is there a better color combo for one of these than Teal and White? We doubt it. Although with the classic lines of this body style, it would look good in about any color, so it really comes down to personal preference. What does distinguish this paint job from most others is the level of effort and expertise that went into prepping these body panels to make sure they were straight and true before a single drop of that beautiful paint was sprayed on. Complimenting that paint is plenty of chrome and stainless that looks brand new too. Up front a V8 badge graces the center of the hood over Ford in shiny letters and an eggcrate grill that wraps all the way around the headlights and is underlined by a sharp looking bumper. There is a Ford 100 Twin I Beam badge on the front fenders and Custom Cab lettered in chrome on the door. Polished stainless runs down the side, dividing the two-tone, and Ford is lettered in white on the tailgate over another sharp looking bumper. Open the door and you will find that the two-tone with chrome theme continues in the interior too. The door panel has a white section surrounded by chrome piping with the door handle and window crank mounted in it. The steering wheel as well as the column are Teal with a semi-circular horn ring with a Ford center button and a three on the tree shifter for the manual transmission. The simple dash is Teal on top with a machine turned panel trimmed in chrome holding the speedometer and basic engine gauges. The one deviation from stock in this truck is an Alpine FM/CD player for your listening pleasure as you cruise to the next show, club event or vacation. The bench seat is pleated in fresh Black upholstery while the headliner is trimmed out in white and the vinyl flooring has carpeted 100 floor mats that look great. Open the hood and you will find an engine bay that is all stock and show quality restored. The firewall is Teal with black inner fender wells and a 352 cubic inch engine is nestled down between them. The shiny black oil bath air cleaner has the 352 decal on it and feeds a 4-barrel carburetor. The engine iron as well as the valve covers and intake are all dressed in Gold and everything is loomed nicely presenting a neat and clean appearance. The exhaust heads out through stock manifolds and back through Flowmaster mufflers that give the truck a nice sound and the power flows back through the three-speed manual transmission. The twin I beam front suspension was a brand-new feature in 65 and was serviced up to work like new during this restoration. Front disc brakes are a nice feature and the rubber meets the road through 235/75R15s mounted on chrome Cragar wheels, but dont worry, the stock wheels come with the truck too. A great looking classic with a super slick paint job and sharp looking chrome. Come on down and check it out. Then think about how much better it would look if it was parked in your driveway.